Underground Railroad Bicycle Route | GetOut! 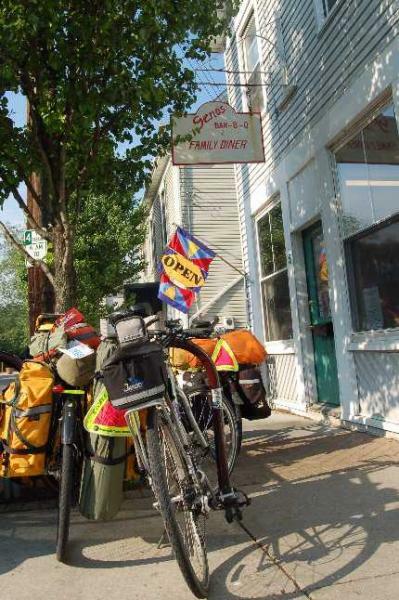 For more information and maps of the Underground Railroad Bicycle Route, go to www.adventurecycling.org. We’re riding our fully-loaded bikes through Cincinnati – downtown, Mt. Adams, Eden Park. 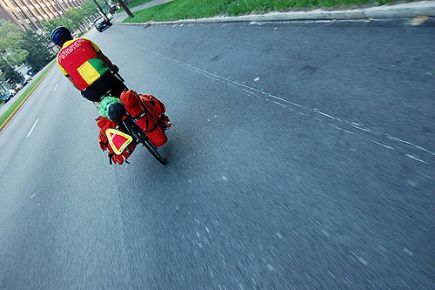 Our bulging panniers and touring trailers make it clear we’re on this ride for the long haul. Seemingly everybody pauses to ask us, “Where ya headed?” – the older couple walking their dog, the woman on her way to work, the middle-aged couple in their convertible. “Canada!” we reply, myself included, although I’m only joining the ride for the day. We’re on the inaugural tour of the Underground Railroad Bicycle Route, and when we tell people what we’re up to, they’re always impressed. Everyone is so fascinated with this journey, so interested in learning more, so friendly, so ready to offer help. Just about everybody dreams of taking an adventure of a lifetime – thru-hiking the Appalachian Trail, backpacking through Europe, riding across America. And the idea of quitting your job to strike out on a journey that will take months or even years is surely a measure of freedom. And not everyone has the guts to do it. Today is the chance for our passersby to live this dream vicariously, however briefly. The newly mapped Underground Railroad Bicycle Route, sponsored by Adventure Cycling and the Center for Minority Health, certainly qualifies as an adventure of a lifetime. 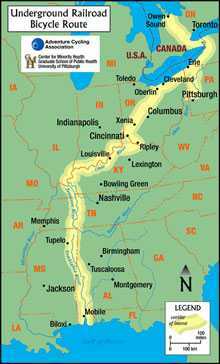 It’s a 2,000-mile route from Mobile, Alabama to Owen Sound, Ontario. Fourteen people are undertaking this trip together, and it doesn’t take long to figure out that they’re each on their own journey and that their lives have randomly intersected at this point. 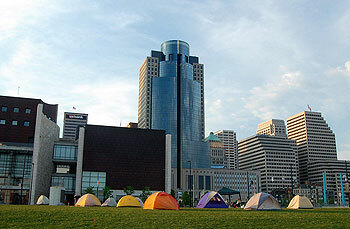 I meet up with the group at their temporary camp on the lawn of the Freedom Center, an Underground Railroad museum in downtown Cincinnati, right on the northern bank of the Ohio River. I ask how the first 1,200 miles of the self-supported ride have been. “This is sort of like a Survivor challenge,” says rider Pam Fischer. 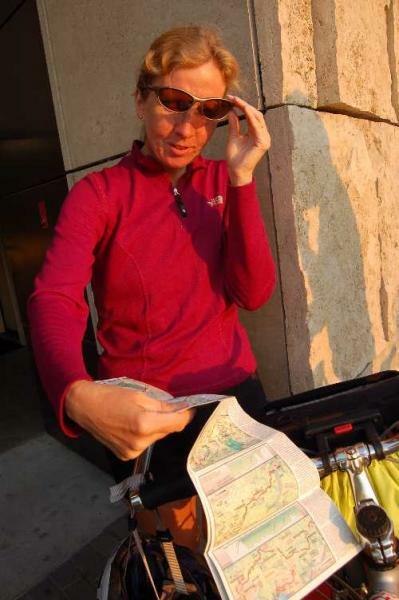 “Except we can’t vote people off,” tour leader Joy Santee responds to the unintended setup. Knowing laughter all around. I talk with Joy and the other tour leader Alvin Justelien. How many miles are we riding tomorrow, I ask. Eighty, Alvin tells me. My eyes widen. He’s pulling my leg. He explains that he’s the sweeper, so he’ll keep an eye on me. “I’m gonna be in the very back tomorrow,” he says. “No, no,” I assure him, “I’m gonna be in the very back tomorrow.” The longest ride I’ve done this season is 30 miles. These people do 30 miles every day before they even eat their second breakfast. It’s my first chance to talk with the riders about the Underground Railroad. Surprisingly, most seem to have only a mild interest in the topic. But then again, they’re here because they want to ride, not to study history. However, all of them express a profound respect for those who made the trip in a much different manner – under cover of night, fearing for their lives, taking great risks and literally depending on the kindness of strangers. Freedom meant something different back then. About the only thing escaped slaves and the riders have in common is a mutual fear and loathing of unchained dogs. Pam and her husband Scott Spaulding are real Maine Yankees and they have a dialect quite different from Alvin’s. I try to get them to say things that will please my ear. But wouldn’t you know, out of 14 people we can’t scrape together one car to park. I can barely understand Yuji Komoto who flew from Japan to join this tour. He’s an American history buff and very cheery cyclist. He’s definitely the tiniest person on the trip and bets are on as to whether he or his loaded bike weigh more (my money’s on the bike). There are two cyclists from San Diego, Steve Hayford and Harvey Cain, and there are a few cyclists I don’t know anything about because they will hit the road before me in the morning and, of course, I will not catch them. Overall, it’s a pretty diverse group, even though we have only one African-American on this leg of the trip. That’s Norman Peterson (yes, the same name as the character on Cheers), and he’s acting as my host since it’s through Norm that I connected with this group. The riding day starts at 6:30 a.m. at the Freedom Center and everyone leaves and rides pretty much at their own pace. Some groups come together and break apart throughout the day. 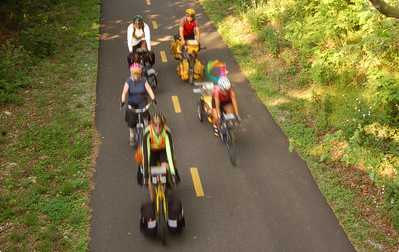 My subgroup rides through Cincy to Milford, Ohio, where we run into a north-to-south group doing the route in reverse. 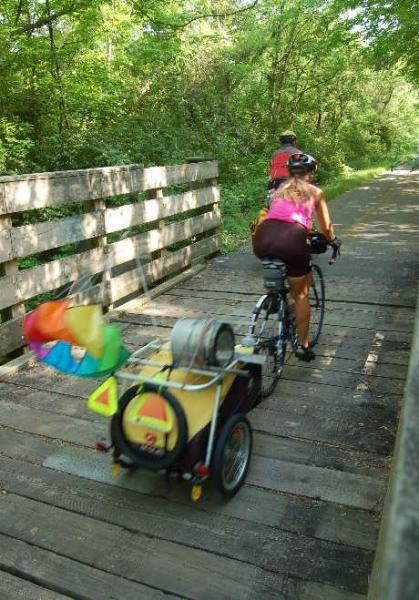 They’re young Canadian guys who recently graduated from university; they’re wearing cutoffs, riding old rustbuckets and one of them has a Frisbee crammed into his pannier. They’ve opted out of the $2,000-plus price tag on the official tour. DIY types. I like them. We have breakfast number two at Geno’s restaurant in Milford. “Where ya headed?” again leads the conversation. We’re treated as celebrities and make friends with the owners and other diners by the time we leave. Then it’s another 50 miles on the Little Miami Scenic Trail. While we pedal on the flat, shaded, flower-lined path from one small town to another, Norm and I have plenty of time to talk. I ask him if he finds himself often thinking about the escaped slaves on the Underground Railroad. It’s not that Norm isn’t concerned about black folks, just the opposite is true. It’s just that Norm isn’t a historian; he’s more concerned with the here and now. He’s a nurse and his journey is to help people understand how to live a healthy lifestyle. 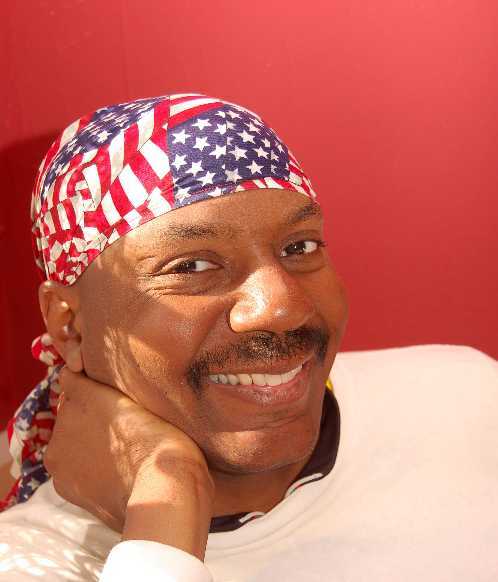 “Obesity and diabetes know no race, no class, no boundaries,” Norm tells me. “As a nurse, I can talk about health disparities while I’m on a bicycle. So it’s kind of a dream come true for me.” The health disparities he’s talking about can be expressed through the age-adjusted death rates for the African-American population compared to the white population: 38 percent higher for stroke and 28 percent higher for cancer, among other similar figures. Norm heard about this trip from Mario Browne, who along with Norm is a member of Pittsburgh’s Major Taylor Cycling Club. Mario is also a project director at the Center for Minority Health, which is a co-sponsor of the route. “We saw the great opportunity to diversify the sport of cycling and the whole adventure of seeing America by bike,” he says of CMH’s involvement in the project. When the cyclists congregate for ice cream breaks, the talk often turns to bike gear, camping gear and past tours. As we eat our cones and slushies in the otherwise ghost townish Morrow, Ohio, Joy rolls up with another cyclist. “Who’s the other Pittsburgher here?” asks the cyclist who I will soon learn is Danny Chew. “Hey, I know you,” Norm replies. Turns out that when Norm was still a teenager he met Danny, a professional cyclist. Norm challenged Danny to a sprint. Danny dropped him immediately and it was an exciting moment for the younger athlete. People know who Danny is because he is a two-time winner of Race Across America (RAAM). He is endlessly energetic. He has the personality of an autistic savant, spitting out bicycling aphorisms one after the other, often beginning with “Let me tell you.” For example, “I averaged 14.7 miles per hour when I won RAAM, including three hours a night sleeping.” Not that anyone asked. Then he describes the best roads for bicycling where we live. Mary Reed is the editor of Get Out! until she sells the business for a million dollars and renames herself Supreme Allied Commander of Adventure.